Articular cartilage damage of a joint can be a very difficult problem. The articular cartilage is the cartilage lining on the end of a bone. As one of my colleagues used to tell patients, articular cartilage is “the white stuff on the end of a chicken bone.” It provides some degree of shock absorption for the joint and provides a smooth surface for range of motion. Injury to the articular cartilage of the joint comes from either a direct blow or wear and tear over time. Articular cartilage damage can range from softening of this cartilage to cracks or fissures within the cartilage to full-thickness defects with exposed bone. Note the smooth appearance of healthy articular cartilage (red arrow). I look for damage to the articular cartilage any time I scope a joint, such as the knee or shoulder. I like to demonstrate the status of this cartilage to patients after surgery. I tell them that the articular cartilage should look smooth, like a cue ball in pool. If it’s not smooth, or there are areas where it is thin or missing, this is damage to the articular cartilage. Arthritis is essentially widespread or diffuse areas of cartilage damage. Treatment of articular cartilage injuries can be a very difficult problem. As I said, these injuries can occur from a direct force to the joint. In this case, the joint will appear swollen, and the athlete might have localized pain. Often the symptoms can be subtle, especially when it occurs in conjunction with injuries to other structures, such as the meniscus of the knee or joint ligaments. Rest, avoiding pressure on the injured joint, and ice can be very helpful at decreasing pain and swelling. If the area of cartilage damage is very localized, especially in the knee, the athlete might feel a catching sensation in certain positions of motion, but the symptoms can be somewhat nonspecific. 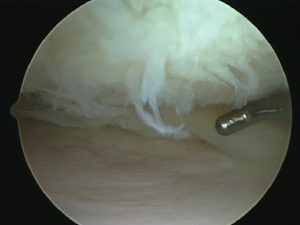 Reversing the damage to the articular cartilage is an even more difficult problem. Orthopedic surgeons really have no reliable means of making the articular cartilage new again. Anti-inflammatory medications and over-the-counter medications such as glucosamine and chondroitin have not shown any reliable ability to lubricate or rebuild articular cartilage. A cortisone injection into the joint might make the patient feel more comfortable, but it does little to treat the underlying damage. If anything, there is concern that cortisone, especially when injected repeatedly, might actually soften the cartilage and theoretically speed cartilage breakdown. Newer types of injections, or viscosupplementation, have been thought to be a better attempt to deal with articular cartilage damage, but there has been no evidence that the injection of these products, such as Synvisc or Supartz, has much effect on reversing cartilage injury. People have even speculated about using platelet-rich plasma, but there is no evidence to date that it would be effective for cartilage damage. Surgical treatments are difficult as well. For small, localized articular cartilage injury, especially in the knee, surgeons have historically had several options. 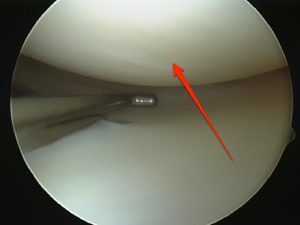 Arthroscopy of the joint and using a shaver to “clean up” the damaged cartilage might decrease symptoms, but it does little to rebuild cartilage. Long-term success of this operation is rare. Microfracture is a surgical procedure where the surgeon takes what essentially is a fancy ice pick and pokes holes in the underlying bone to try to stimulate bleeding and create fibrocartilage. While it does seem to create a new layer of fibrocartilage, the concern, especially long-term, has been that this fibrocartilage is not nearly as durable as the hyaline cartilage that makes up the articular cartilage. Long-term success of microfracture has come into question over recent years.Transferring a cylinder of bone and cartilage from a non-weight-bearing portion of the knee into the damaged area can also be attempted. This procedure, often called an OATS procedure or mosaicplasty, does have a role in small defects. 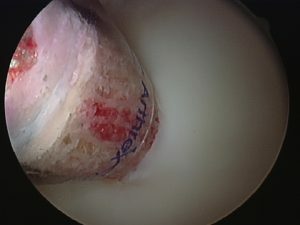 Autologous chondrocyte implantation, or putting cartilage cells under a layer of periosteum in the cartilage defect, has been tried with varying levels of success. Again, widespread cartilage damage is essentially arthritis, and very few options exist except for a joint replacement when the pain becomes too great for the patient to perform his or her normal activities. The surgeon takes a cylinder of bone and cartilage from another part of the knee and transfers it into the defect.